I was at my sister Lou’s house recently and, as she’s got a very new little bub, I was helping her make some vintage button earrings for the mother’s day stall at her son’s school. So effective and so simple! 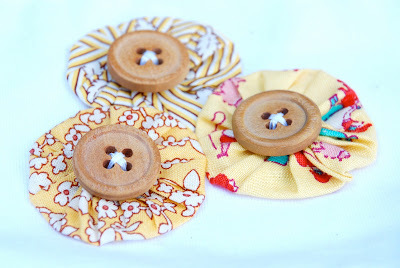 I went straight home afterward and delved deep in the vintage button stash that I inherited from my husband’s great aunt to find as many matching buttons as I could so I could make some for myself! 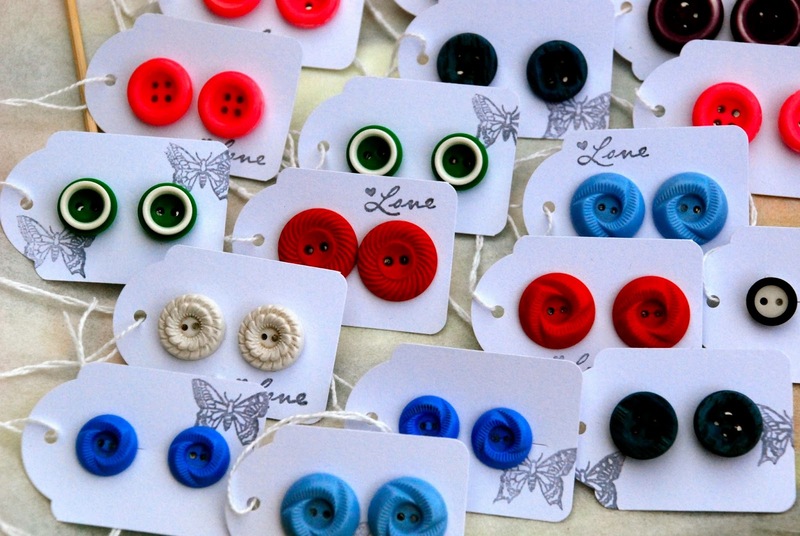 All the supplies, from the earring backs (you can even purchase the clip-on kind) to the special glue and even the vintage buttons, can be purchased online from Etsy or Craftumi (among other sites). The store I have used before is here. The strongest and best glue to use when making the earrings is E6000. The glue does take a few days to fully set though, so although these are the ideal quick and easy DIY, you’d need to give yourself a few days before wearing or gifting them. 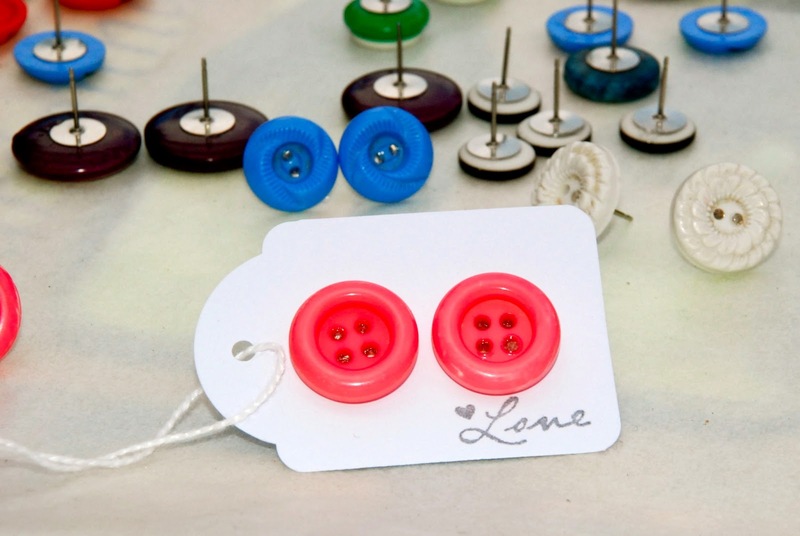 Do you love vintage buttons? Which ones are your favourite in the pic above? For more easy peasy gift ideas (for yourself or others!) you might like to check out my series on Simple Handmade Gifts for Girls or my recent post on Simple DIY Mother’s Day gift ideas. 1. Make some masala chai for one. We have made lots and lots of these tea sachets using seed packet sized envelopes purchased at office supply stores and I’d highly recommend, however I ordered some tea bags from the Haby Goddess last week and they arrived this morning. I’m really excited to try out our masala chai for one recipe in the tea bags and also Jodie’s hot chocolate recipe which simply uses grated chocolate and marshmallows in the tea bags – yum! 2. Make your own flavoured Hot Chocolate. As mentioned above, how cool would these be in tea bags? You’ll find the recipes for the ones we made below in this post. 3. Sew your own teatowel. In counteraction to the last suggestion, for those mothers who do actually remember their bags at the supermarket a little more regularly, decorating a calico shopping bag is something we love to do. Whether it is apple printing, fabric paint or no-sew applique. Follow this link for my tutorial. What are your thoughts on handmade gifts? Not worth the hassle? Cheapskate? You just can’t top handmade? Love handmade, but just prefer someone else to make it? 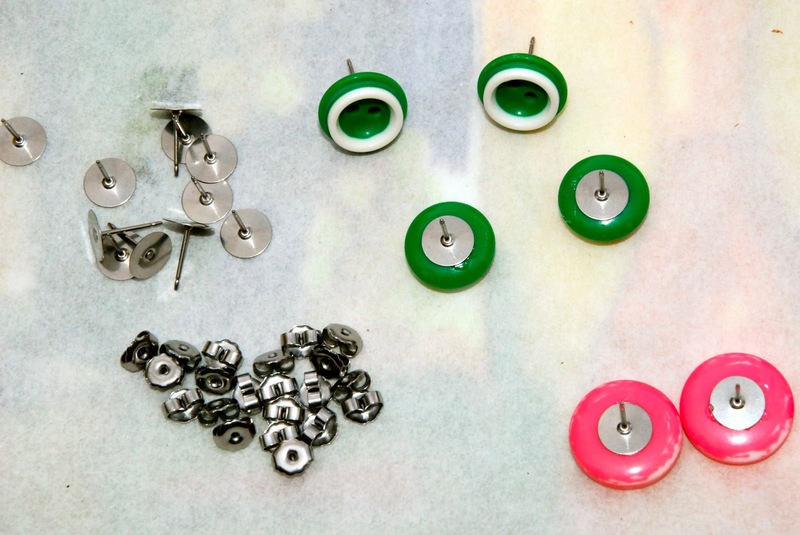 Just glue some earring backs on the back of some vintage buttons and you have some pretty funky earrings. Details of suppliers in this post. Fun & fizzy in the bath. For step by step instructions on how we made these go to this post. Some origami paper stuck on a wooden clothes peg using double sided tape and magnetic strip attached to the back. 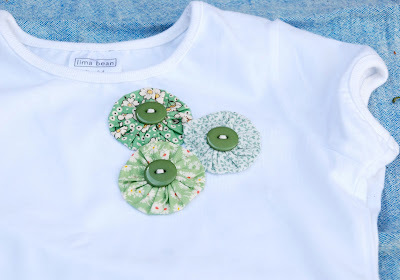 Mother’s Day is coming very soon here in Australia and in the lead up I thought I’d do a couple of posts on quick and simple (yet still stylish) gifts for Mums that kids can be involved in or totally make on their own. I’m notoriously late in organising pressies and can often be found quickly whipping something up the night before. These gifts all fit into that category – perfect last minute gifts! You’ll see pics of two colours here which I hope isn’t too confusing. The purple mix was for lavender bath bombs where we used dried lavender, lavender essential oil and purple food dye and the yellow mix was for citrus bath bombs where we used grated lemon and lime rind, lemon essence and yellow food dye. 3. Slowly add wet mixture to dry mixture. 4. Add some water, using a spray bottle, a little at a time and mix together with your hands until it becomes a thick, slightly damp powder. The pic below is an example of how much water to put in. When you scrunch it up in your hand, if it holds it’s shape, you have enough. If you put in too much water you’ll know as it starts to expand when you put it in the moulds and won’t stay put! 5. Pack the mixture firmly into silicone molds. I used ice cube & mini muffin trays. Frog was 3 years old at the time these pics were taken and even though, as you can see, a rather large mess was created, she was very involved in the process and did lots of it on her own (under a watchful eye of course)! 6. Leave them to dry in the mold for about 10 minutes before popping them out of the mold onto a teatowel to dry. Leave them overnight to really harden. Or you can just leave them in the mold overnight before popping them out in the morning. 7. The next morning, once they are completely dry, run yourself a bath! Or package them up as a gift for Mother’s Day! Above is a pic of some that we made one Christmas using orange rind and essential oil – the smell was divine! 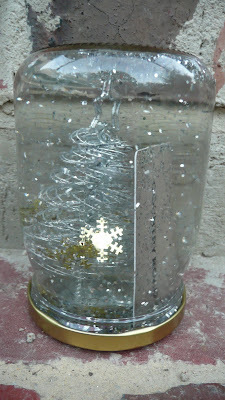 You might also like to try making some bubble bath to go with the gift like the one we made below. See this post for our recipe. Stay tuned over the next week for more quick and easy gifts that you can make for Mother’s Day, or any time of the year really. What are you doing for Mother’s Day this year? Paper has always been a favourite craft medium of mine. Japanese paper* is something that we have a soft spot for at our house and due to Goose’s love of all things Japanese, we have it in abundance. As well as a cute gift, these ideas would make great party favours also! I made this fabric covered notepad using the same method that I used to make my Christmas cards last year. Ironing fabric on to the cover using vliesofix. Simple, but very effective. Full tutorial here. I just wrapped some paper around the pencil and eraser using some mod podge glue. Full tutorial on pencil here. can quickly be made into something cute & giftworthy. To make the peg magnets, I simply used double sided tape and stuck the pegs onto a sheet of patterned paper and used my scissors to cut around the peg. I then attached a magnet onto the back. I can imagine the gift above being given with a fabric covered notebook or some free printable stationery like this one. Goose and I made up this little package for our lovely friend Shannon’s birthday last week – who also happens to be our gorgeous babysitter! paper covered pencil – tutorial here. paper garland made from a mix of old sheet music & origami paper. Take out the tea and add some origami paper and an instruction sheet on how to make their own origami creatures. There are many simple origami tutorials to be found here. The Japanese card above was made from an old children’s encylopedia, along with some origami paper. Stay tuned for more simple handmade gifts for girls and even some guest posts from some other crafty handmade gift givers in the coming weeks. If you are interested in doing a guest post for this simple handmade gifts for girls series – send me an email - I’d love to hear from you! Linking in today with one of my favourite creative places on the web. * I purchase all of our origami paper from ebay where there are many different sizes and prints to choose from. I have found this store particularly prompt & helpful. 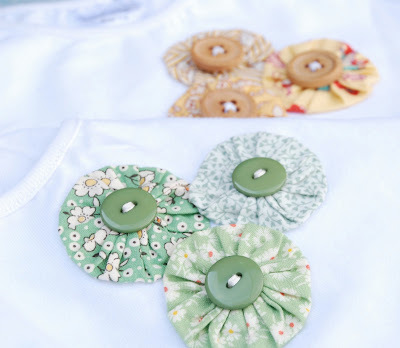 Just like the previous posts of simple handmade gifts for girls, this craft is quick and easy and uses up your fabric scraps. 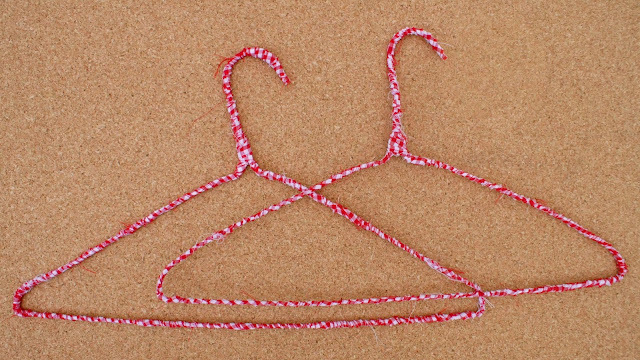 Perfect for a bit of last minute gift making. 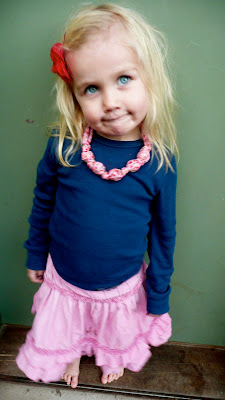 I borrowed my sister Lou’s yo-yo maker to make them and they were so quick and easy. A couple of minutes each. You could purchase one at your local craft store, but they also sell them here or here for around $10. They even come in other shapes like hearts, butterflies & flowers. here is a link on how to make them without one (also quiet easy). You can add them to a t-shirt like my sister Lou, who made these cute green & yellow numbers. 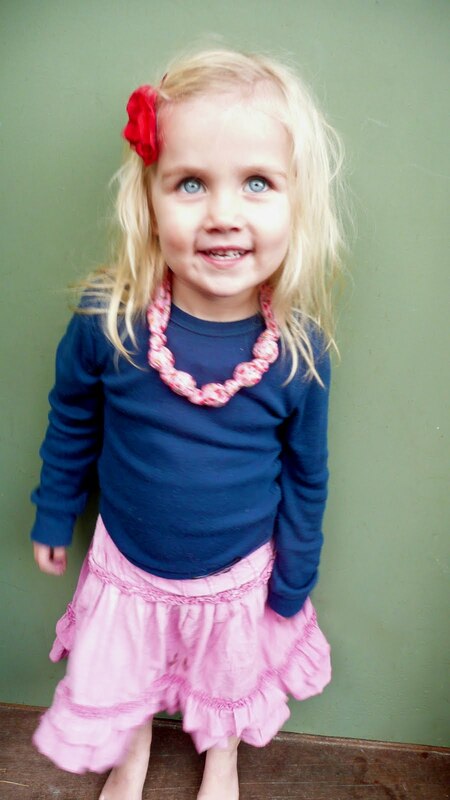 Frog has one of these gorgeous t-shirts (gifted to her by her Aunty Lou) and it is one of her absolute favourites! 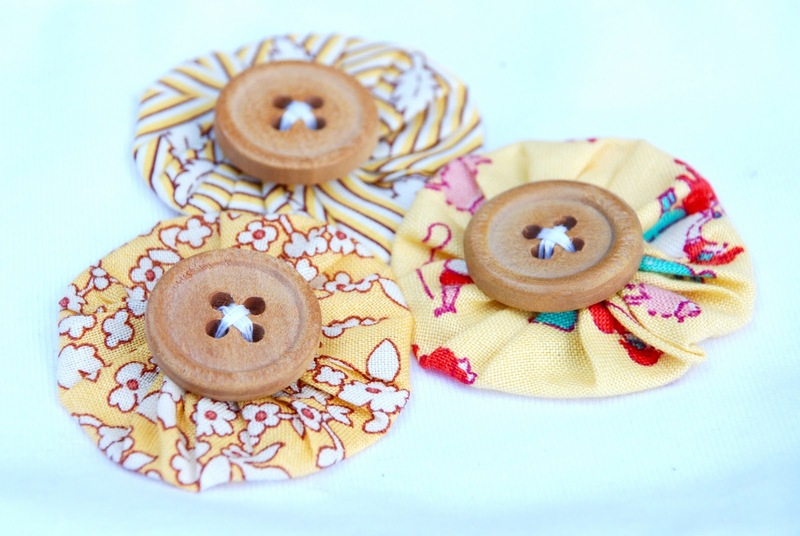 I think they might also become as addictive as the fabric covered buttons. Actually, I have combined the two and have been making headbands with a yo-yo and fabric covered button on the top for Frog and a few of her friends for their birthdays. As well as embelishments for headbands and tshirts, you could add a brooch back, or sew onto a hairclip or a hairtie, put them on a card or even sew them together and make a cushion, a bracelet or a garland. I have even heard of people sewing them together and making whole quilts out of them! For more creative inspiration I’ll be heading over to our creative spaces today. If you have made some simple handmade gifts for girls, I’d love to hear about it. I’d love to include a guest post or two if anyone is interested? This is the first installment, as promised, in a little series of posts of quick and simple, yet stylish handmade gifts for girls that even a beginner sewer like me can make. So quick in fact that you can make most of them in about 5 – 20 minutes, therefore making them the perfect last minute, whipup the night before, gift for those of us who may or may not be 100% organised! 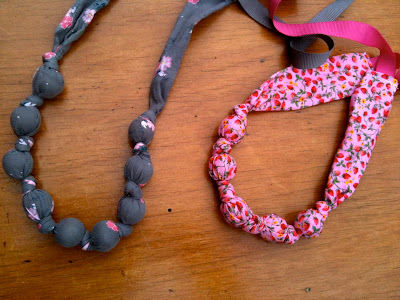 Part one – Fabric Knotted necklaces. I made the two in the photo above for my two girls. As you only need a very thin strip of fabric, you can get away with purchasing just a 10cm strip of fabric, use leftover scraps, or even recycle old or thrifted clothes! The necklace on the left, was made using one of Goose’s old skirts. 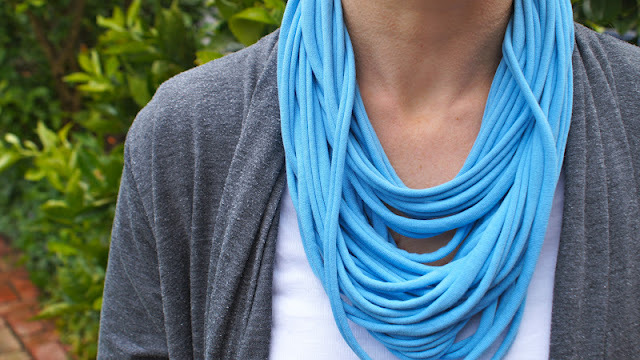 You can thrift an old beaded necklace, or just use marbles. In mine, I used 20mm wooden beads purchased at Spotlight. Serendipitously, I discovered a new blog this week who happend to have a tutorial ready made for these necklaces, just as I had made them. Thanks Amy for saving me the trouble! So, if you’d like to give these a try, head over here for an excellent tutorial. Or, if you’d like to try a bracelet, using the same method, head over here. Stay tuned for more simple handmade gifts for girls over the next couple of weeks. Thanks so much to those of you who have forwarded me links of things that you or others have made that I might like to try – keep them coming! Inspired by party preparation over here a while back, I thought I’d share a fun idea that was quite the craze at our house last year – magnetic dolls! All you need to do is print some paper dolls onto magnetic paper*. Cut them out** and pop them in a tin for a gift or travel toy, or straight onto the fridge. Paper dolls can be found in many places on the net. Nicole has posted about some gorgeous free vintage printable paper dolls which would be ideal! I went one step different from this and asked my talented sister (whose drawings are on my blog header and side bar) to draw me some gorgeous little black and white paper dolls. We printed them onto magnetic paper, cut them out and gave them as a gift along with coloured textas for the child to color in themselves. If you type in ‘printable paper dolls’ into etsy.com, you can purchase some for a minimal amount, even this one, designed especially for magnets and which also comes with a page that you can color in just like these! * I purchased mine at Officeworks – Avery brand. It is very thin, so easily goes through your printer and cuts easily with regular scissors. Alternatively, magnetic sheeting is also available online in thicker sheets. You can print onto regular paper, stick onto magnetic sheet and cut out in the same way. Magnet is stronger, but it is also tougher to cut out. You’ll need a simple & basic image to do this. ** When cutting, you just ignore the little tabs on the paper dolls. I am really excited that I have finally discovered the joy of sewing! Completely inspired by so many of my bloggy friends – it has opened up a whole new world! Admittedly, I purchased the sewing machine (from ALDI, no less) for the purpose of sewing on cards & paper, but recently have started trying out a few quick and simple projects. The kind that can be completed in a night. That way I get that lovely satisfied feeling of job completed and I’m actually working within my skill level – absolute beginner who had to remember the basics from when I did sewing in high school 20 years ago. Along with a new love for sewing, I have reclaimed my love of giving handmade gifts! Mainly so that I have a reason to sew! I found the perfect pressie for boys turning 4 when Bear had a run on birthdays last month – they all received rice/bean bags and a drawstring bag. Easy to make and were all very well received! In searching for some simple gifts for Goose & I to make for her friends, girls turning 8, I came across some fantastic ideas which we’ve been making. I’ll share those ideas, along with some tutorials and links, as soon as I get a chance to take some photos of them! I know lots of you who read this blog are sewers…any ideas for quick and simple projects for a beginner like me?? I’m off to check out the new home of ‘my creative space‘ to be inspired! A couple of weeks ago, Goose had a friend over after school and they were looking for an “activity” to do. Goose whipped out an old ‘Mister Maker’ book and they all made snow domes. I was surprised at how easy it was! Simply put some plasticine in the lid of a jar, stick a small toy or two firmly in the plasticine, fill jar with water and glitter and put lid back on to jar and you have your very own snow dome! I have seen them made by adding a little glycerine as well, but ours worked well enough without it. 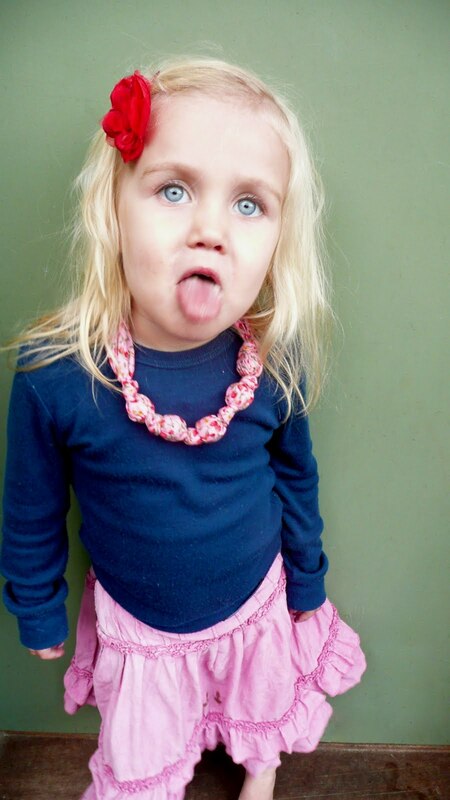 For more simple kids craft ideas, you might like to check out our kids craft page here. * They did test the gift cards out after a week and they still worked, but they did suggest not to leave the gift card in the water for any longer than a week! ** If you’ve never heard of these charity gifts, you really must check them out! This year we are giving a toilet to someone…not quite sure how I’ll make that one into a snow globe yet… ADDITION DEC 2011 – We made them this year! Check them out in this post.